Need a pick-me-up, stat? Cool and refreshing, a glass of this Lavender Tulsi Sparkling Water will instantly brighten your day. 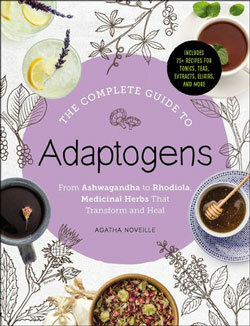 Agatha Noveille, author of THE COMPLETE GUIDE TO ADAPTOGENS, shares the quick and easy recipe. The only ingredients needed to make this refreshingly simple seltzer are lemon, lavender, and tulsi. Tulsi excels at offering emotional support during particularly stressful days or when you are feeling a little down. 1) Pour the sparkling water into a glass. This will be the base of your drink. 2) Add the serving of tulsi extract and the 5 drops of lavender extract. Stir with a spoon to disperse the extracts into the water. 3) Squeeze the lemon wedge gently over the glass and drop it into your drink. 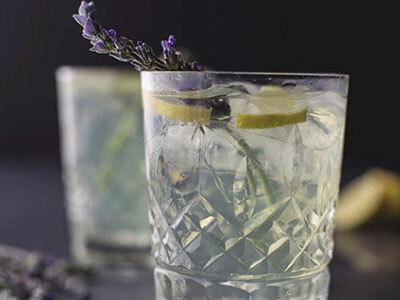 Garnish with a sprig of fresh lavender buds, if desired. Want more? For recipes featuring other herbs that can help increase your energy, stamina, mental clarity, and much more, pick up a copy of THE COMPLETE GUIDE TO ADAPTOGENS by Agatha Noveille. What are adaptogens and how do they support wellness? Find out here. Excerpted from The Complete Guide to Adaptogens by Agatha Noveille. Copyright © 2018 by Simon & Schuster, Inc. Used by permission of the publisher. All rights reserved. Agatha Noveille is the founder of the Common Branch Herb School, a grassroots herbal classroom that promotes herbs as a way to safeguard community health and resilience. In addition to writing her own blog, The Independent Herbalist, Agatha is part of the writing team at The Herbal Academy. She writes regular posts for The Survival Mom blog, and has contributed articles to a variety of magazines and periodicals, including MindBodyGreen.com and From Scratch magazine.